We’d love your help. Let us know what’s wrong with this preview of Murder in an Irish Village by Carlene O'Connor. To ask other readers questions about Murder in an Irish Village, please sign up. A man has been murdered and with all the evidence pointing to her brother, it's up to Siobhán to solve the crime. Well this is really very good. It's a cozy mystery set in a small Irish town. To be honest, it feels like it was written 50 years ago and that's the best thing about it. It's a lot like those great BBC crime shows they broadcast on Saturday nights. Not the greatest book ever written but charming and well worth the effort. The setting for the story is Kilbane, County Cork, Ireland. Our protagonist is Siobhan O’Sullivan. Siobhan was about to leave Kilbane to attend university in Dublin when her parents were killed in an auto accident. She is the oldest of six children so she stayed to take care of her siblings. The next oldest is James, but he is an alcoholic. They all work in the family bistro called Naomi’s Bistro. One morning on opening the café they discover a murdered man sitting at a table. James is arrested The setting for the story is Kilbane, County Cork, Ireland. Our protagonist is Siobhan O’Sullivan. Siobhan was about to leave Kilbane to attend university in Dublin when her parents were killed in an auto accident. She is the oldest of six children so she stayed to take care of her siblings. The next oldest is James, but he is an alcoholic. They all work in the family bistro called Naomi’s Bistro. One morning on opening the café they discover a murdered man sitting at a table. James is arrested for the murder and Siobhan is off to solve the crime. This is a new author and narrator for me. I believe the story is what is being called a cozy murder. The book is well written and most engaging. This is a charming story set in a quaint village that adds charm to the story along with some interesting characters. My only complaint is some information was repeated during the story. A good editor should have cleaned that up. I read this book as an audiobook downloaded from Audible. It is the narrator, Caroline Lennon, that makes this book such a pleasure to listen too. This is a book that should only be read as an audiobook to fully enjoy the story. Her lilting Irish brogue was a delight to listen too. The book is about ten hours long. I am going to be looking for books narrated by Caroline Lennon; she is a great narrator. Thanks to Net Galley for letting me read this so I could review it. This is a nice cozy mystery read set in the small town of Kilbane in the County Cork of Ireland. Siobhan O'Sulllivan has been having a terrible year. Her parents were killed by a drunk driver and her plans of going to University of Dublin have been put on hold. She has 4 younger siblings and an older brother, James, to take care of. She also runs the family bistro so they have income. She has a full plate. Then the brot Thanks to Net Galley for letting me read this so I could review it. Then the brother of the man in prison for killing her parents ends up dead in the bistro. James is arrested. Nothing will stop Siobhan until she finds the real murderer and frees her brother. She starts questioning people she's known her life and turns the town upside down. An enjoyable comfort read. It was like the book version of a hot cup of good tea. When I was looking for a new audiobook for my commute, I chose this book in the hopes of hearing a little lilting Irish brogue. On that note, I was not at all disappointed. The narrator was absolutely fantastic. I could have listened to her read an Irish phone book and been satisfied. As for the book itself, it was okay. Not amazing by any means but decent. On the good side, it really seems to capture the small town Irish mentality (as far as I know it, which admittedly is mostly from watching Moo When I was looking for a new audiobook for my commute, I chose this book in the hopes of hearing a little lilting Irish brogue. On that note, I was not at all disappointed. The narrator was absolutely fantastic. I could have listened to her read an Irish phone book and been satisfied. On the good side, it really seems to capture the small town Irish mentality (as far as I know it, which admittedly is mostly from watching Moone Boy). Things move just a little bit different than what I'm familiar with here or from the many British novels I've read. The characters, at least most of them, were also pretty decently well rounded. Siobhan was, at least. The author has definitely put a decent amount of time considering who Siobhan is and how she'd interact with the world. On the not as good side, the pacing wasn't quite right. Not that it was terrible, but there's a bit too long of a stretch in the middle where there's a lot of investigating but not quite enough happening. Siobhan is constantly considering new clues based on the original event (sometimes considering a bit too much, rather than letting the reader consider for themselves), but what it really needed was another twist or new development earlier on. We get one towards the end, but if it had been moved up slightly, it would have gone a long way toward helping the pacing. The ending also drops off a little too quickly, tying up the murder, but leaving us before really resolving how things move with the rest of the town. Maybe that's on purpose. Maybe there will be a sequel, though if more people get killed in that town, it'll have a higher crime rate than a season of Law & Order. There were also a couple of cringe inducing points. A lot of "Oh Siobhan, you shouldn't be doing that. That's not your place. You're place is in the kitchen," said by multiple people multiple times. Plus she did a few things that were just, well, dumb. The worst was one scene where she and her family accidentally set the drapes on fire at a wake, right next to the dead body. Maybe good for an episode of I Love Lucy, but a bit out of place for a murder mystery. Natalie's Bistro is the most popular place to eat in this small Irish village. It is very important to the six O'Sullivan's because it is their home as well as the business which supports them. Siobhan O'Sullivan makes wonderful brown bread and she has become the guardian of the four younger children. She is the manager of the Bistro even though her brother James is older. He is trying to over come an alcohol addiction. He helps when he can but he is not always able. All of life changed several m Natalie's Bistro is the most popular place to eat in this small Irish village. It is very important to the six O'Sullivan's because it is their home as well as the business which supports them. All of life changed several months ago when their parents were killed in a head on collision. Since then not only has Siobhan taken over the guardianship of her younger sisters and brothers, but she has also given up her dreams of Dublin and university. The family's situation becomes even worse when a young man is found murdered in the Bistro. He somehow got in in the middle of the night. Worst of all, he is the brother of the young man who killed their parents in that terrible automobile accident. He was not someone who is welcome in the Bistro at any time. When James becomes the prime suspect, Siobhan becomes an investigator. She is familiar with the village and everyone who lives there and she is not afraid to ask hard questions. It is unthinkable that anyone in their well loved community could have committed this murder. But, if someone is a murderer Siobhan is determined to find them. This village is typical of a small town. Everyone knows everyone's business. But as she investigates, Siobhan finds that there are secrets. At times she is nearly heart sick because the people she has loved since childhood are not always who they have appeared. This plot is interesting. As each new fact is uncovered the reader is carried right along with Siobhan and her siblings. As she gets nearer to the actual villain, it appears there may be more danger than anyone expected. The youngsters in the family help with the detecting by helping with much of the work in the Bistro and even creating a list of possible suspects. Siobhan is a terrific heroine. She is so focused on clearing James that she nearly misses the fact that there is someone in the village who is attracted to her. She is a woman of humor and wit as well as intelligence. Her knowledge of the personalities of the people around her gives her an advantage but also may put her in harm's way. The secondary characters are actually not very secondary. Each of them adds so much to the story that it seems impossible to believe the book would have been as well done without every single one of them. We have the younger children in the O'Sullivan family, neighbors who have been there to help through all the troubles, a young policeman who arrests James because the evidence points to him and each of these people are important to the story. The feelings of family, love, frustration and the character of the villagers are important textural assets to the story. If I were to find any fault, it would be that at times I felt things became too wordy. But, I also recognize that wordiness provides the atmosphere and true Irish character to the book. This is Ms O'Connor's first book and it seems she has started off at the top of her game. She has created a hard act to follow for herself. She has give us an interesting mystery with characters who are terrific. There will be great expectations of Ms O'Connor's next book. I received this book from the publisher through NetGalley in the hope that I would write a fair and honest review. All opinions are my own. Unfortunately this book just wasn’t for me. It didn’t feel like a cozy despite the attempt at a charming Irish village. And the pacing was just too slow. The dialogue was awkward and overall it just felt as if the author was trying too hard. The narrator, Caroline Lennon, makes this audiobook an absolute delight to listen to. Her enchanting Irish lilt draws you into the story and makes you feel as if you are right there in Kilbane chatting with and listening to the citizens. I tried to look up Lennon’s biography to see if she was truly Irish or if her affectation of the Irish lilt was just very believable, but I couldn’t find anything much on her. Her pacing is perfect and you can hear all of the emotions – fear, concern, love, etc. in her voice. I’ll definitely look for more books narrated by Caroline Lennon. Carlene O'Connor is a new-to-me author, but I’ll definitely look for more from her. Since her great-grandmother emigrated to the US from Ireland and the author herself splits her time between the US and Ireland, her representations of Ireland should be spot-on. The story is well-plotted, excellently written and the characters are lovely to meet. The prose is so descriptive that you can see the beauty of the Emerald Isle and commiserate with Kilbane’s inhabitants over the frequent rains. Siobhan (shi-vawn) O’Sullivan and her family, known as the O’Sullivan Six, have had a very, very, very bad year. Almost exactly a year ago her parents were killed in a car accident, she had to give up her college plans and now, she’s responsible for running the family Bistro and caring for her four younger siblings – Grainne (Grawn-ya) who is sixteen, Ann, Eoin (Owen) and Ciaran (Keeran) as well as her older, by two years, brother James who had taken to drinking. The anniversary of her parent's deaths is just a few days away when the nasty brother of the man who was convicted in the drunk-driving accident. That stirs up all of Kilbane, but especially the O’Sullivans and James in particular. James has been alcohol-free for six months, but the appearance of Niall Murphy sends him out on a temper-fueled bender. The next morning, when Niall is found in the bistro, stabbed through the heart with a pair of scissors, James is the Gardai’s (police) prime suspect. When James cannot remember any of the events from the previous evening and splatters of Niall’s blood are found on James’ clothing, he is arrested. Siobhan believes that the Gardai, including their local Garda, Macdara Flannery have focused on James and aren’t looking any further, so it is up to her to find the real killer. She starts awkwardly questioning her friends and neighbors and ends up with most of the village angry with her. That doesn’t stop her though, she has to save James. Garda Macdara, who is sweet on her, keeps asking her to back off and let the Gardai handle it, but she doesn’t trust them to really look for anyone else. There are red herrings galore, but I was pretty sure I knew who the villain was from the first or second time he/she was mentioned. It was fun to read and find out if I was right or not! Add in an American visitor to put a wrench in the budding romance and you have an interesting read! I loved this book so much!! This is one of those rare cozies / authors who make me feel like I'm spoiled for most cozies. High standards. I loved the characters and the complex mystery. I also felt very swoony over the love interest and something simple but romantic he said (can't say it but if you read this book, you'll know) it's a mystery but that was the most romantic line. Ahhhh!!! Great reading! I've been in the mood for a cozy mystery for several months, but I seem to start and stop them quickly. Many were just difficult to get into. But this one was exactly what I needed. I loved Siobhan and her family. Their history and the connection to this mystery made her involvement plausible. It was even more in depth than I expected. I look forward to continuing! Carlene O'Connor's charming new cozy Murder in an Irish Village is as delectable as a slice of the authentic Irish brown bread Siobhan is known for. From the authentic dialect to the lush description of village life, Carlene O’Connor brings the village of Kilbane to life. I was thrilled by the deft inclusion of appropriate Irish slang, and the glossary that accompanied the novel. Since the death of their parents, Siobhan O’Sullivan has been managing the family restaurant and her five siblings. Li Carlene O'Connor's charming new cozy Murder in an Irish Village is as delectable as a slice of the authentic Irish brown bread Siobhan is known for. Since the death of their parents, Siobhan O’Sullivan has been managing the family restaurant and her five siblings. Life isn't easy, but she's making a go of it. Things get a lot harder when Niall, the brother of the man responsible for their parents' death asks for 10,000 EU in exchange for proof that his brother wasn't responsible - especially when he shows up dead in their bistro a few days later. The local garda suspect Siobhan's older brother, James, and are looking no further, despite the fact that Niall argued frequently with many in the village. With her older brother and their livelihood at risk, Siobhan and her siblings start their own murder investigation. One of the things that makes this novel uniquely enjoyable is the interplay between the O'Sullivans. Although the siblings frequently disagree, they are a loving family who work well together. Their at times clumsy investigation turns up clues sometimes relevant, sometimes not. But the village on the whole is tolerant, even when Siobhan uncovers some embarrassing facts. The touch of romance between Siobhan and local garda Macdara is sweet. This colorful, richly detailed and lively cozy mystery is certain to please fans of the genre. I anxiously await the next book in Carlene O'Connor's series. Murder in an Irish Village is available for preorder and will be released February 23, 2016. I received a copy of Murder in an Irish Village from the publisher and Netgalley.com in exchange for an honest review. This is the first book in a new series and I found it very enjoyable. I enjoyed the characters and setting of the story. Siobhan and her brother, James have been taking care of their younger siblings since their parents death by a drunk driver. The family has a bistro that makes just enough money for the family to get by. One day the brother of the person accused of killing Siobhan's parents in the drunk driving accident comes back to town saying his brother didn't do it. This man ends up dead i This is the first book in a new series and I found it very enjoyable. I enjoyed the characters and setting of the story. Siobhan and her brother, James have been taking care of their younger siblings since their parents death by a drunk driver. The family has a bistro that makes just enough money for the family to get by. One day the brother of the person accused of killing Siobhan's parents in the drunk driving accident comes back to town saying his brother didn't do it. This man ends up dead in the famly bistro and the Guarda, the local police suspect Siobhan's family. The plucky redhead is determined to solve the murder before her family ends up in jail and the family business gets shut down. I enjoyed this story very much. The first few chapters set up the backstory for the family and that was a little slow moving but once past that, the story moved at a brisk pace. I enjoyed the characters and the small town in County Cork they live in. I also enjoyed getting to know the whole family by their involvement with solving the mystery. There were some twists to the story that helped make it interesting. I can't wait to read the next book in this series. The real rating of this book is between a 2.5 to 2.75. Throughout this book I wasn't sure if this was supposed to be a true murder mystery or a cozy murder mystery. I think it's the first one since they had young people in danger and most cozy mysteries I've read haven't done that, but arguments for either could be done. As a murder mystery the story wasn't as well developed as I would have liked but the characters were developed enough to not be boring. In the beginning, I was interested in seei The real rating of this book is between a 2.5 to 2.75. Throughout this book I wasn't sure if this was supposed to be a true murder mystery or a cozy murder mystery. I think it's the first one since they had young people in danger and most cozy mysteries I've read haven't done that, but arguments for either could be done. As a murder mystery the story wasn't as well developed as I would have liked but the characters were developed enough to not be boring. In the beginning, I was interested in seeing how this book ended and who was the killer. Sadly the more I read, I found myself becoming less interested in the killer as the book seemed to drag on. It was so easy for me to put this book down for long periods. I even considered putting this book down and starting a new book. All these reasons are why my rating is on the low side. I could see some people enjoying this book but true fans of the mystery genre would be disappointed in this book. This was a lovely audible to listen to! The thick Irish accents are definitely what kept me tuned in! The story was a 3-3.5 “okay” for me. I enjoyed it but it’s not particularly memorable or different. I had picked this up thinking it was a cozy mystery (similar to the Lady Hardcastle series—recommend!) and it isn’t but it’s also not the usual detective / police procedure murder investigation book. Early into it I described it to a friend as the book version of the game “Clue” and think that’s ve This was a lovely audible to listen to! The thick Irish accents are definitely what kept me tuned in! I had picked this up thinking it was a cozy mystery (similar to the Lady Hardcastle series—recommend!) and it isn’t but it’s also not the usual detective / police procedure murder investigation book. Early into it I described it to a friend as the book version of the game “Clue” and think that’s very accurate. Siobhán (21) is running her parents cafe with her brother (who is struggling with drinking) and also caring for their 4 other brothers and sisters after their parents suddenly died in a DUI car crash. The brother of the drunk driver shows up, tries to extort money from them and the next day is found dead in their cafe with Sio’s drunk brother as the #1 suspect. Siobhán decides to figure out the mystery herself (to save her cafe, her brothers life, and because it’s too terrible to think anyone in their tight knit community could do this). The story follows her as she pokes her nose around, collects clues and tries to put it all together. I've had a fascination with and love of all things Irish for quite some time, so I was excited to join this tour and to have the opportunity to read Murder in an Irish Village. Set in the small village of Kilbane, County Cork, Ireland, Siobhán O’Sullivan is trying to focus on raising her five siblings and keeping the family bistro in business. It has only been a short time since the accidental death of Siobhan's parents, when everything changed for the entire family. Siobhan, who was once lookin I've had a fascination with and love of all things Irish for quite some time, so I was excited to join this tour and to have the opportunity to read Murder in an Irish Village. Set in the small village of Kilbane, County Cork, Ireland, Siobhán O’Sullivan is trying to focus on raising her five siblings and keeping the family bistro in business. It has only been a short time since the accidental death of Siobhan's parents, when everything changed for the entire family. Siobhan, who was once looking ahead to university in Dublin, has stayed to care for her family, especially given her older brother's troubles with drinking. The O'Sullivan family tries their best to steer clear of Niall, the brother of the man who caused the fatal car accident that took their parents' lives, but he isn't making it easy, cornering Siobhan and attempting to extort money from her. Infuriated by the attempt, and even more so by Niall's claims that his brother is innocent, Siobhan would have been thrilled to never see Niall ever again. Unfortunately, not only does he continue to turn up, Niall's final visit to the family bistro ends in his death. Siobhan and her siblings find the young man sitting at a bistro table with a pair of scissors stuck in his chest. Suspicion is immediately cast on Siobhan's eldest brother, but she knows that he couldn't have committed the crime. Against the advice of the local authorities, Siobhan sets out to clear her family name and find the real murderer. I enjoyed this story and the mystery. It seemed to get off to a slow start, then pick up speed quickly before slowing down again. There were times when the sheer number of characters and how they were connected felt a little overwhelming and confusing, but the story was compelling enough to keep me reading. The writing felt authentic and I liked the bits and pieces of Irish dialogue throughout. 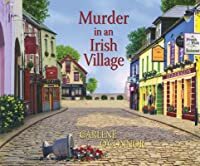 I'm not sure if Murder in an Irish Village is the start of a series, or simply a stand alone story, but it's a fun, fast read for fans of cozy mysteries. Murder in an Irish Village centers around Siobhan O'Sullivan and her five siblings. The family resides in Kilbane, a small village in Ireland and operates their family business, Natalie's Bistro. The O'Sullivan Six as the children are fondly known, lost their parents in a car accident involving a drunk driver. Siobhan as the oldest girl has taken over the responsibility for keeping the business open, and has been awarded guardianship of her four younger siblings. Older brother James should be sho Murder in an Irish Village centers around Siobhan O'Sullivan and her five siblings. The family resides in Kilbane, a small village in Ireland and operates their family business, Natalie's Bistro. The O'Sullivan Six as the children are fondly known, lost their parents in a car accident involving a drunk driver. Siobhan as the oldest girl has taken over the responsibility for keeping the business open, and has been awarded guardianship of her four younger siblings. Older brother James should be shouldering these jobs but a bout of alcoholism after their parents death left him untrustworthy. Siobhan had been planning to leave for college in Dublin and she does harbor some regret that she was unable to enroll with her two best friends. Billy Murphy is the young villager accused of driving drunk and killing the very popular O'Sullivan's. Billy's mother Mary still resides in town however she has become mostly a recluse as the local townspeople have ostracized her, and Billy's bad boy brother Niall has recently resurfaced. Niall approaches Siobhan and says that he has information and proof that his brother did not cause the accident that took the O'Sullivan lives, but he needs ten thousand euros before he tells her what really happened that fateful night. Angry that Niall is blackmailing her, Siobhan tells James and her other siblings about the conversation. James who had been ten months sober goes off on a bender, terrified for him Siobhan becomes even more fearful when she discovers Niall dead in the Bistro and her brother beat up and passed out drunk in the alley. It's no surprise that local gardia consider James the prime suspect. Determined to clear her brother's name and find the real killer Siobhan sets out to investigate. She is shocked to learn that her sister has been corresponding with Billy and is suspicious when her questions seem to rile some of the villagers that were also her parent's close friends. Siobhan O'Sullivan has had a rough year. She has lost her parents to a horrible auto accident, her chance to go to school is put on hold and she is responsible for taking care of her siblings as well as running the family bistro. When Niall, the brother of the man who was convicted of killing her parents shows up, demanding money and spouting his brothers innocence, Siobhan doesn't know what to think. Is it possible that someone else was responsible for the accident? Not only is the landlord try Siobhan O'Sullivan has had a rough year. She has lost her parents to a horrible auto accident, her chance to go to school is put on hold and she is responsible for taking care of her siblings as well as running the family bistro. When Niall, the brother of the man who was convicted of killing her parents shows up, demanding money and spouting his brothers innocence, Siobhan doesn't know what to think. Is it possible that someone else was responsible for the accident? Not only is the landlord trying to find a loophole to evict the O'Sullivan Six from their restaurant and home, but Siobhan's brother James has a drinking problem and when he falls off the wagon and has a fight with Niall, it sets of a series of events that will leave you on the edge of your seat. I am new to this author and I am so pleased to have found another wonderful writer in this genre. The story did start off slow for me, but once it picked up I honestly could not put it down. I appreciated that the author gave name pronunciations and definitions of the terminology she used. There were so many secrets and twists in this book and I was shocked with the outcome! I did not see it coming at all, the ending was definitely not predictable. I am looking forward to reading more in this wonderful series. The O'Sullivan Six are a loving family who know how to stand together and put their family first. This was an enjoyable mystery. For me, it started out a little slow setting up the backstory for the main characters but once the murder occurred the paced picked up nicely. The mystery had plenty of twists and turns with a surprise (at least for me) as to the identity of the killer. I like that the whole O'Sullivan family was involved throughout and we got to know each of them as the story unfolded. Siobhan is a likable character. She is independent and complex as she struggles with her new rol This was an enjoyable mystery. For me, it started out a little slow setting up the backstory for the main characters but once the murder occurred the paced picked up nicely. The mystery had plenty of twists and turns with a surprise (at least for me) as to the identity of the killer. I like that the whole O'Sullivan family was involved throughout and we got to know each of them as the story unfolded. Siobhan is a likable character. She is independent and complex as she struggles with her new role as guardian to her younger siblings. The story was well written and felt authentic with great Irish dialogue. I'm not sure if this is intended to be a stand alone or series but I would read another story by this author. Un buon libro. La protagonista tende a essere un po' testarda e ad accusare un po' tutti di omicidio, ma la storia si fa leggere. E c'è anche un po' di domande. Mi sono piaciute le descrizioni dei monumenti storici del villaggio e i resoconti sulla sua storia. 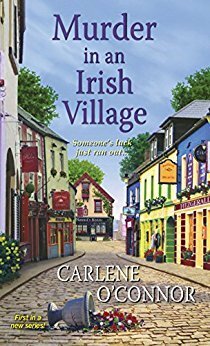 Peccato che sia fittizio perché avrei voluto visitarlo... Stranamente entrambe le serie cozy mystery irlandesi sono ambientate nella contea di Cork: ci devo proprio andare! It's been a year since the O'Sullivan parents died in a terrible car crash, and their six children are still struggling a bit, both emotionally, and in keeping their restaurant, Naomi's Bistro, open and running. Siobhan, the eldest daughter, is guardian of the four younger children, and manager of the bistro, putting aside for now her plans to attend university. The eldest O'Sullivan, James, is not doing these jobs because he slipped into alcoholism after his parents' deaths. At six months sober It's been a year since the O'Sullivan parents died in a terrible car crash, and their six children are still struggling a bit, both emotionally, and in keeping their restaurant, Naomi's Bistro, open and running. Siobhan, the eldest daughter, is guardian of the four younger children, and manager of the bistro, putting aside for now her plans to attend university. The eldest O'Sullivan, James, is not doing these jobs because he slipped into alcoholism after his parents' deaths. At six months sober, Siobhan is not ready to rely on him too far yet. With the anniversary of the deaths approaching, it's not a good time for them. It gets worse when, on the morning of the anniversary, they enter the bistro to find Niall Murphy, brother of the young man who was driving drunk and is now in prison for killing their parents, sitting at one of the tables, quite dead, with a pair of scissors in his chest. James, angry that Niall was back in the village and had said threatening-sounding things to Siobhan, had gone out in a rage and gotten drunk--and had clearly gotten in a fight. He's the obvious suspect. Macdara Flannery, local garda, sweet on Siobhan as he apparently is, can't help but notice this, and he has to do his job. Convinced that there's little chance of Macdara and the other garda asking enough questions (especially since she doesn't initially tell them some important facts), Siobhan decides she has to investigate, too, because she can't leave James unprotected. This is a small village, and even with the presence of one visiting American, there on business no one seems to be really sure of, there's little chance the murderer isn't someone Siobhan knows well. Yet she can't believe it's any of them. A village this small is almost family. Her suspect list soon includes some of the village's most prominent citizens, and people she is very close to. O'Connor gives us a likable and engaging cast of characters. It's a nice little cozy mystery, the narrator is very good, and as the start of a series, my main concern is that the murder rate could soon come to resemble that of Cabot Cove, of the tv show Murder, She Wrote. The tv show, however, was able, when things became too ridiculous, to send professional mystery writer Jessica Fletcher on all kinds of travels, to find dead bodies elsewhere than in tiny Cabot Cove, Maine. Siobhan is a bistro manager, responsible for four growing siblings, and her ambitions beyond that focus on going to university and studying Celtic literature. One can only be alarmed for the citizens of Kildane, Ireland! Nevertheless, this was very enjoyable and a good listen. Recommended. "I'm not trying to protect you.....I'm doing my best to protect you everyone else in town from the likes of you." This is a delightful cozy! I adored Siobhan and the all the O'Sullivan's. The banter and quirkiness reminded me a lot of the early days of Stephanie Plum. I can't wait to read the next installment. A cute cozy mystery set in Ireland with a fabulous narrator. Just what I needed! Siobhan O’Sullivan lives with her five brothers and sisters in the small village of Kilbane, County Cork, Ireland. She and her brother, James, have been in charge of their younger underage two brothers and two sisters since their parents were killed by a drunk driver a year before. Natalie’s Bistro, the family restaurant, barely makes enough money to keep the family going, and Siobhan has turned down a scholarship to a college in Dublin to stay in town with her family. One day, Niall Murphy, the Siobhan O’Sullivan lives with her five brothers and sisters in the small village of Kilbane, County Cork, Ireland. She and her brother, James, have been in charge of their younger underage two brothers and two sisters since their parents were killed by a drunk driver a year before. Natalie’s Bistro, the family restaurant, barely makes enough money to keep the family going, and Siobhan has turned down a scholarship to a college in Dublin to stay in town with her family. One day, Niall Murphy, the brother of the drunk driver, returns to town and insists that Billy, his brother, was not at fault. He attempts to sell her the proof for ten thousand euros. When James, a recovering alcoholic, learns of this, he gets drunk at the local pub and has words with Niall. Early the next morning, the Siobhan and her siblings find Niall dead in their bistro and determine that James did not return home that evening. James is arrested for Niall’s murder, but Siobhan knows that he was not capable of killing anyone. She takes it upon herself to find Niall’s killer to the consternation of garda Macdara Flannery, who has an interest in Siobhan. I was pleasantly surprised by this book. It reminded me somewhat of an Agatha Christie novel, where the plucky young girl takes it upon herself to solve the mystery. There were enough clues that it was possible to figure out the mystery, but it was not obvious. Siobhan and her family end up suspecting most of the people in town before Siobhan finally solves the case. That part was a little unrealistic to me because the villagers, for the most part, were not angry with the family, but seemed willing to overlook that they had been accused of murder. I thought the characters were very likeable, and I enjoyed the budding romance between Siobhan and Macdara. The villagers were somewhat stereotypically humorous, and it was fun to read about their interactions with each other. Just like many small towns, everyone knew everyone else’s business, but many of the villagers still had secrets they did not want to be brought into the open. Without giving away the ending, I felt that it was a little weak. It did not make sense to my why the person who killed Niall did so. He was murdered to cover up a supposed crime, but in my opinion, I’m not sure that what happened was actually a crime. Anyone who enjoys a good cozy mystery would appreciate this book. One warning I have is that the author uses Irish slang and many Irish names. She does include a pronunciation guide and a glossary at the beginning of the book that was very helpful, but some people may find the Irish dialogue hard to read. Siobhan O'Sullivans parents were killed in an automobile accident and her plans of going off to Trinity College in Dublin with her two friends were cancelled. Instead, as the eldest daughter of what the village of Kilbane fondly refers to as "the six", she stays home to take care of her younger siblings and to run the family bistro. Niall Murphy, the brother of the man who was found responsible for the death of Siobhan's parents, comes to Siobhan stating he has proof that someone else is responsi Siobhan O'Sullivans parents were killed in an automobile accident and her plans of going off to Trinity College in Dublin with her two friends were cancelled. Instead, as the eldest daughter of what the village of Kilbane fondly refers to as "the six", she stays home to take care of her younger siblings and to run the family bistro. Niall Murphy, the brother of the man who was found responsible for the death of Siobhan's parents, comes to Siobhan stating he has proof that someone else is responsible for their death and has a video to prove it. All he wants for the video is 10,000 euros. When his body is found sitting at a table in her bistro, Siobhan's older brother, James, is arrested for the murder. James, an alcoholic, was found past out and can't remember what happened. It seems circumstances and some evidence point to James as being the killer, but Siobhan is adamant that he has been set up. After it is apparent that the garda (police) look no further than her brother, Siobhan decides to investigate herself to clear her brother's name. During the course of the investigation, it is apparent that Niall was blackmailing a few people which to Siobhan's mind would add to the suspect list. I loved this book because it was written so well, I thought I was in Ireland without leaving my couch. I thought the mystery was well written, the characters well developed, it had some humor in it and some romance (the attraction of Macdara Flannery, a member of the garda, and Siobhan was very apparent and sweet). I didn't guess who the murderer was until the end of the book. This is the first book I've read by this author, and it certainly won't be my last. I can't wait for the next book in the seriesI would recommend this book to those who love cozy mysteries . PLEASE NOTE: I was given a free copy of this book by the publisher through Netgalley.com in exchange for an honest review. Siobhan has had a terrible year. She has left her dream to study at the University of Dublin to take care of the family bistro, after losing her parents in a car accident. She must also take care of her many younger siblings. Things get complicated when a man is found dead in her local and one of her brothers is accused of murder. Siobhan will have to investigate to save both her brother that her activity. The story is really well written, unpredictable, with several twists. It was hard to put it down because from the first chapters I really wanted to know the ending. All the characters are well developed, even the secondary. I like O 'Sullivan family , despite occasionally quarrel they are very united and very willing to help each other. This was a truly engaging and delightful read that I enjoyed from beginning to end.